As part of MediaRoad, we made contact with NMA. NMA, full Next Media Accelerator, is one of the largest hubs for media innovation in Europe. As the NMA invited us to their half-yearly demo day in Hamburg, we chose to combine our trip with some other potential partners. Due to NMA's strong (inter)national community, we easily got access to the right media organizations. After arriving in Hamburg we went directly to ARD Aktuel. ARD is a joint venture between the German public regional broadcasters and the German world broadcaster Deutsche Welle.We met the persons responsible for innovation regarding Tagesschau. Tagesschau is the daily news of the ARD broadcasters that is broadcasted on Das Erste. Tagesschau is the largest news broadcast in Germany with more than ten million viewers per night. One of the spearheads of Tagesschau is to reach a younger audience. They told us which innovative initiatives ARD takes to achieve this goal. For example, their app with a new way of video editing reached over five million downloads in a short time. And their integrated chatbot on Facebook and Twitter also connects significantly more people in their twenties to their brand. When we told them about VRT Sandbox they see opportunities to integrate external innovation within their brands. Later that day we arrived at NMA's demo day. At this informal event, NMA's graduate startups got the chance to pitch for the NMA community - after a few keynotes. Among the 9 international startups, we could find 23 ° (https://www.23degree.org/), which helps you to easily find reliable data in one place. And Cutnut (https://cutnut.net/) allows interaction story formats, by providing the easiest Story Content Creation platform available. RAWR (https://newsroom.rawr.at/) organizes the world's opinion and makes it universally accessible and useful. We speak to the various startups, ask them more in-depth questions about their product/service and analyze whether they can offer added value for VRT. The next morning we started at Greenhouse. They help internal (and external) founders to validate ideas, test business models and invent products that inspire people. Their model brought us a lot of insights that can strengthen our own intrapreneurship track. A little later we hurried to Der Spiegel. Der Spiegel is Germany's largest and most influential weekly magazine, including Spiegel TV and Spiegel online. 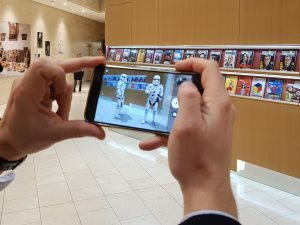 Our contact person in charge of the Tech lab told us that Der Spiegel has a rather classic operation and one of the ways to step out of this is by introducing innovation: discovering new markets, changing technology,... They also showed that through the use of push apps the engagement of their audience increases by 10 to 20%. We discussed the various learnings, the challenges surrounding the intellectual property, experiment with Google Pixel "AR Core" and ended with the intention to see to what extent a collaboration via the Sandbox Hub is possible. We ended our trip at the NMA, where we exchanged information about each other's business models. NMA runs a six-month program for startups, invests up to € 50k per startup, connects startups to more than 100 mentors and has a gigantic network among German's media and publisher organizations, as well as international partners. Together we concluded that it makes sense to set up a partnership for the future! After a fruitful trip, we return home. It's obvious, over the past years, Hamburg built an ecosystem of startups, media partners and investors.